Norwegian architects, Snohetta, seem to be on a roll as we head into 2017. 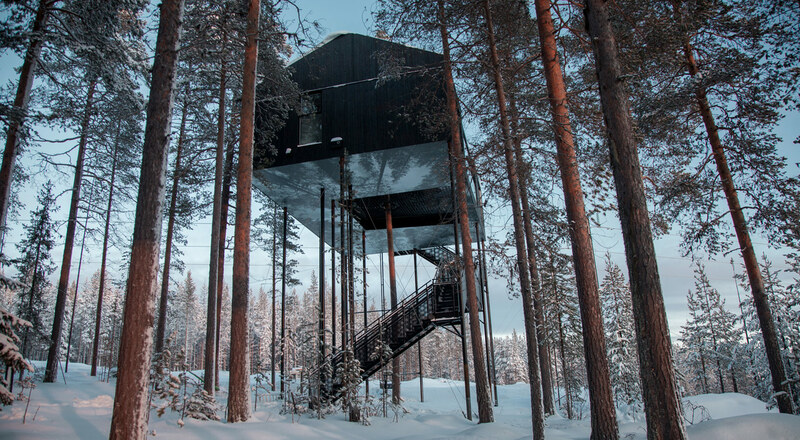 The 18 January saw the Harads Treehotel (Sweden), which offers its guests a treetop experience, open its seventh cabin set among the branches. The aptly named Seventh Room –a cabin that nestles ten metres up in the trees of a pine forest– is also a Snohetta design. One of the interesting features of this new treehouse is that, when approached from below, you look up to discover that the entire base of the building, formed of aluminium plates, is covered by a life-size photograph mirroring the tree canopy, a smart way of camouflaging the cabin within the forest, while respecting the appearance and character of its surroundings. The outside of the cabin is also clad with black charred wood for an even more effective disguise. And what exactly is hiding up there? The 100 m2 cabin, which sleeps 5 people, is an experience in itself. It features a living room, a bathroom with shower and two double bedrooms plus a sofa bed. The decor is a showcase of organic materials, Scandinavian woods and top quality textiles that make for a warm, cosy interior. But the pièce de résistance is to be found on the outdoor patio. A net suspended across the branches of a large natural pine allows guests to go out onto the netting and sit or lie against the branches and listen to the sounds of the forest while contemplating the starry night sky and the magnificent Northern Lights. North-facing large panoramic windows have also been incorporated into the design, along with skylights in the bedrooms, which blur the boundaries between the indoors and outdoors and allow guests to enjoy the beautiful views.